Alexander D. Thomson was born in Scotland in 1856. He first came to the United States with his family, including a brother named A. G. Thomson, in September, 1860. The Thomsons arrived in Boston and eventually settled in Peterborough, Ontario, Canada. Not much is known of Thomson before he arrived in Duluth. An article that appeared in the Duluth News Tribune on April 5, 1904, calls him an “old-time rancher” and states that he “rode bronchos [sic] as a cowboy in the great roundups before the wire fence was introduced on the ranges.” The article references his 50,000-acre spread, the “T.O. Ranch, in Raton, New Mexico. Thomson is thought to have first come to Duluth from Montreal as early as 1882, but he did not establish permanent residence in the Zenith City until after his marriage to Helen L. Ostrom, whom he married in Ontario in 1884, and just before the birth of their first child, Edna Archer Thomson, who died before her first birthday. The Thomsons had one other child, Adam Gentles Thomson, born in 1888. Soon after his arrival in Duluth, Thomson and Chicago grain trader William Dunn founded Dunn, Thomson & Co., also called Dunn & Thomson, a grain-trading firm. Dunn & Thomson first set up office in the Grand Opera House at 330 West Superior Street before moving to the Williamson Block at 125–127 West Superior Street in May, 1885; by 1886 they claimed an office in the new Board of Trade building at 302–304 West Superior Street. 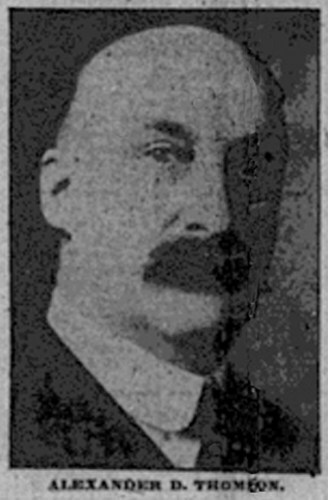 In 1887 Thomson was elected vice president of the Duluth Board of Trade; he was already a director of the organization. Dunn & Thomson later became A. D. Thomson & Co., and one of Thomson’s principal partners was C. A. Pillsbury, the man behind Minneapolis’ largest flour mill. In 1905 Thomson took over the operation of the Great Northern grain elevators in Superior. It made sense: Thomson was a “dear friend” of James J. Hill and a major investor in Hill’s Great Northern Railroad. Thomson also invested in mining and was the president of Cliff Mining Co., which owned properties in Utah. Thomson also once served as director of the Duluth, Missabe & Northern Railroad, the North American Telegraph Company, the First National Bank of Duluth, and the Swedish American Bank of Minneapolis. 1901 Thomson, Thomas D. Glaskin, and Edward G. Hilliard organized the Thomson-Glaskin Company, wholesalers of “commercial rubber goods, mine supplies and heavy hardware” and specialists in asbestos-pipe covering. In 1902 Thomson-Glaskin merged with Kelley-How, a Duluth hardware wholesaler started in 1896, to form Kelley-How-Thomson, which went on to be one of the Midwest’s largest hardware wholesalers. By 1906 they were living at 219 West 4th Street. In 1912 Helen died of heart failure in Gulfport, Mississippi, where she had gone to seek relief by a change in climate. She left one of the largest estates in St. Louis County history, most of which went to her husband and son. In 1901 Thomson, Thomas D. Glaskin, and Edward G. Hilliard organized the Thomson-Glaskin Company, wholesalers of “commercial rubber goods, mine supplies and heavy hardware” and specialists in asbestos pipe covering. In 1902 Thomson-Glaskin merged with Kelley-How, a Duluth hardware wholesaler started in 1896, to form Kelley-How-Thomson, which went on to be one of the midwest’s largest hardware wholesalers. Kelley-How-Thomson merged with Duluth’s Marshall-Wells Company in 1955. By 1958 the conglomerate was liquidated. A. D. Thomson was described as “widely philanthropic” and donated $10,000 toward the establishment of St. Paul’s Macalester College; he would serve on the college’s board of directors. He was extremely generous to his daughter-in-law when she first became engaged to his son in 1917, giving gave her a pearl necklace worth an estimated $130,000—well over $2 million today. Upon his death he willed $25,000 to the Duluth Y.W.C.A. and $50,000 to the University of Chicago’s medical school. Most of the rest went to A. G. Thomson. A. D. Thomson and Helen L. Ostrom married in Ontario in 1884, the year before they arrived in Duluth and the birth of their first child, Edna Archer Thomson, who died before her first birthday. The Thomsons had one other child, Adam Gentles Thomson, born in 1888. By 1906 they were living at 219 West 4th Street. In 1912 Helen died of heart failure in Gulf Port, Mississippi, where she had gone to seek relief by a change in climate. She left one of the largest estate’s in St. Louis County history, most of which went to her husband and son. A. D. Thomson was an active curler in the 1890s, participating in the Board of Trade’s own league. He, Helen, and A. G. travelled often, spending significant time abroad. When they returned from a voyage to England and France in 1901, Thomson declared to the Duluth News Tribune that he and other first-class passengers had formed the “We’re Coming Home to Stay Club,” whose members vowed never to take a steamship crossing to Europe ever again. In 1920 Thomson leased a home Palm Beach, Florida, in an attempt to regain his health; he had not engaged in business in a year due to illness. He died there on February 7, 1921. The Duluth Board of Trade flew its flag at half-staff in honor of his passing. He was buried in the family plot in Peterborough, Ontario; Rev. Dr. James Wallace, the president of Macalester College, presided over the services. At his death A. D. Thomson’s estate was valued at over $3.5 million, just shy of $50 million today. A. D. Thomson was described as “widely philanthropic” and donated $10,000 toward the establishment of St. Paul’s Macalester College; he would serve on the college’s board of directors. Upon his death he willed $25,000 to the Duluth Y.W.C.A. and $50,000 to the University of Chicago’s medical school. Most of the rest went to A. G. Thomson.